The Alps have a way of luring you in, settling you down in a warm cosy sofa while the snow falls outside, a fire burns in the grate and a glass of home-brewed genepi is at hand. That is exactly how it felt to Nikki Quinn when she moved to the Alps from Australia almost 30 years ago. Nikki came as a chalet girl, fell in love with the region and never left. Now she and Hugh, her Irish husband of 18 years, are part of the local community, running a bed and breakfast and a cookery school from their lovely alpine home. The building had not been lived in for 30 years and the barn above was still being used by the local farmer to store his hay and tractor. Despite this, Nikki and Hugh moved into two ground-floor rooms as soon as they received the keys. He concentrated his efforts on making the downstairs warm and comfortable, creating a bedroom, installing a new boiler and turning the makeshift kitchen into something a bit more useful. It took Hugh and Nikki five years to finish the ground floor, but taking things slowly gave them chance to think about the upstairs design and layout. 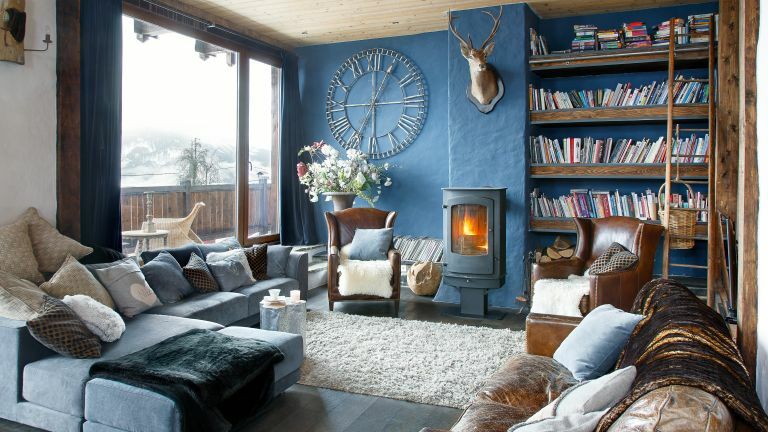 ‘We both love the old materials and methods that were used when the chalet was built 150 years ago, so we were keen to salvage and reuse as much as we could for the renovation,’ adds Nikki. The couple even found the burnt rafters of the barn after it was torched by the Nazis during a raid on the French Resistance in 1944. ‘The barns were all rebuilt the following year as the locals needed them but the old rafters were left in a corner, waiting for us to discover them,’ says Nikki. When things didn’t go to plan Nikki and Hugh were able to call on their neighbours for help. ‘We received an enormous quote to rebuild the roof, so Hugh decided to do it himself, but without our friends and our next-door farmer and his cherry picker, we would never have managed,’ says Nikki. To reroof the building Hugh used as much of the old wood as possible, or scrubbed it down and reused it inside. Doors, frames, walls and floors were all made by Hugh out of the discarded wood. Meanwhile Hugh also took time to design the layout. Nikki’s main requirement was a kitchen big enough for her cookery school and an open-plan living-diner, and the rest was down to Hugh, who used his love of treehouses as inspiration. Nikki has spent many happy hours scouring the local brocantes and vintage shops for furniture and accessories to complete the look. Anything she was unable to source, Hugh has made, turning his hand to welding staircases, creating headboards and even making a dining table from floorboards. The end result is a home that feels like it has been in the family for years. Upstairs Nikki has her dream kitchen, for her cookery school, two large bedrooms and bathrooms, an open-plan living and dining area and a separate living room and bar on the top floor. Downstairs are four guest bedrooms and three bathrooms, a living room, a vaulted dining room and a separate kitchen.